The University of Tokyo Forests were established for research and educational purposes in the field of forestry and forest science. There are seven branch forests in a wide variety of vegetation localities. The forest area is about 32,300 ha in the total. Executive office located in Yayoi campus is established to coordinate various activities of the seven branch forests and Education and Research Center. The role of the office is to coordinate educational, research, public, personnel, financial and international affairs as a center of excellence in forestry, and promote cooperation between the branches and other organizations. The University of Tokyo Chiba Forest was established in the southern corner of the Boso Peninsula in 1894 as the first university forest in Japan. The forest is 2,226 ha in area and in the warm-temperate forest zone, and is covered by various types of forest which consisted of Cryptomeria, Chamaecyparis, Abies, Tsuga and evergreen broad-leaved trees. The University of Tokyo Hokkaido Forest, with an area of 22,715 ha and located in central Hokkaido, is dominated by boreal coniferous forest mixed with deciduous broad-leaved trees. The University of Tokyo Chichibu Forest is 5,812 ha in area and located in Chichibu-Tama-Kai National Park. It is in the cool-temperate zone in the mountainous terrain. Wide area of the UTCF (>85% of total area) is covered with natural forest. The major tree species are Abies firma, Tsuga sieboldii, Fagus japonica, and Fagus crenata. Nineteen out of twenty-six Acer species in Japan are found in the UTCF. The University of Tokyo Tanashi Forest is the nearest university forest to the campus of The University of Tokyo and is about 9 ha in area. Ecohydrology is an interdisciplinary field studying the interactions between forest and water and their ecosystem services. ERI manage the Akazu Research Forest (ARF, 745ha), the Inuyama Research Forest (IRF, 443ha) and the Ananomiya Experimental Forest (AEF, 77ha) for various field researches and educations. Forest Therapy Research Institute is 41 ha in area and located on the eastern slope of Mt. Fuji. The area lies between cool-temperate and subfrigid forest zones. Arboriculture Research Institute in Izu is 247 ha in area and located at the southern end of the Izu Peninsula. 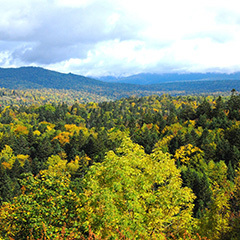 The vegetation is a typical warmtemperate forest covered by evergreen tree species. For example, we have selected possible Eucalyptus species through a field adaptation test over several decades, and are now planning to screen the selected species again for their growth. Education and Research Center is located in Yayoi campus of Graduate School of Agricultural and Life Sciences, The University of Tokyo. Students belonging to the UTF stay here, study and conduct research.